This is what I came home to after a long and miserable work week yesterday. Oy. 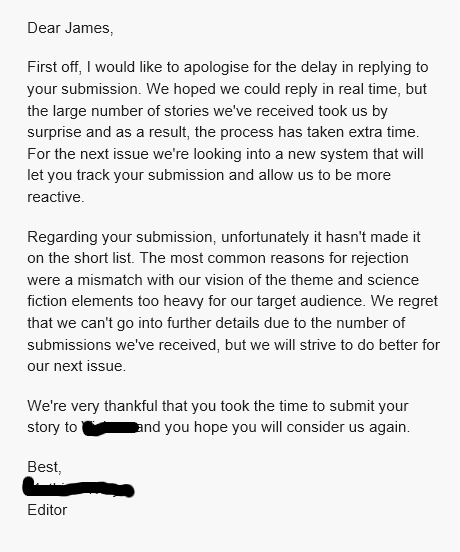 On the other hand, it’s very polite and didn’t actually say my writing sucked, plus the editor was encouraging in inviting me to submit to them again. I realized that all of the stories that have been rejected (three stories and four rejections, one tale was rejected twice) are still “in play” in the Authoring directory on my PC’s hard drive, so I created a separate “rejection” folder for them. I’ll probably rename it when I feel better about it, since it means these stories are once more available to submit. Veteran science fiction author Steven Barnes on his blog sometimes gives out advice to struggling writers, and one piece of advice is don’t re-edit a story unless a publisher specifically requests it. So I probably (for now) won’t change any of the stories that have been sent back to me. However, I should at least re-read them to see if there’s some inherent flaw I was blind to before. I know for my “Mars” story, one editor did give me some feedback, and as much as I’m emotionally attached to that wee missive, I will likely revisit those comments at some point. My concern is that there are stories out there I’ve submitted long ago for which I’ve received zero feedback, which means they could already have been rejected and the editor just hasn’t gotten around to telling me. At least those publications that use the online app submittable let me check the status of my stories, so even if I don’t hear back from the editor, I can tell at what stage they are in their process. That said, I did submit a new story to a publication a couple of days ago, so I’m trying to keep the pipeline active. or the anticipation, of such a letter. I’ll smile when I get one, Kenneth. So far, nada. The missus is out of town, so I’m going to try to spend as much of the weekend writing as possible, with the help of a lot of coffee. As are most rejection letters, this polite missive was all form and no critique. It doesn’t really tell you anything except that they’re not using your story. It may be for no reason but that they’ve already received too many and taken them on a “first come…” basis. The letter does allow for the generic possibility that your story wasn’t quite the flavor that the editor wanted for the current issue, but that’s not a shortcoming on your part, even if true. No re-write was suggested that could enable you to tweak the story for it to be accepted, so don’t even try. You might try submitting it again later, as is, for a future issue. Meanwhile, if you re-read it and see something you feel you could improve per your own sense of quality, go right ahead. This missive reminds me of responses I received during a period of unemployment quite a number of years ago in response to resumes I sent out answering employment advertisements, which could be summarized as: “Better luck next time, kid.”; “Sorry, position has been filled already.”; “We’ll keep your resume on file.”; and, “We have determined that your qualifications do not match our current needs.”. Regardless of how frustrating, the only course to pursue was to continue sending out as many resumes as possible, to as many suitable ads as could be found, in the hope of locating that one of them which would be the right match. At least I have a day job, such as it is. I had received a prior email from this publisher. Apparently, they’re a very small outfit, and when they announced an open submission, they were unprepared for how many authors responded. I think they were just overwhelmed by a bunch of writers hungry to become published. They also suggested that my story might have been too “heavy” for their readership, and after all, my tale did suggest things like mass extinction and genocide. Oops. Nice catch. Fixed. Thanks. Ah, this all makes me want to try again to submit short fiction.